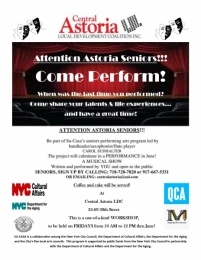 You're invited to SU-CASA's seniors performing arts program from 10 am to 12 pm at Central Astoria LDC. 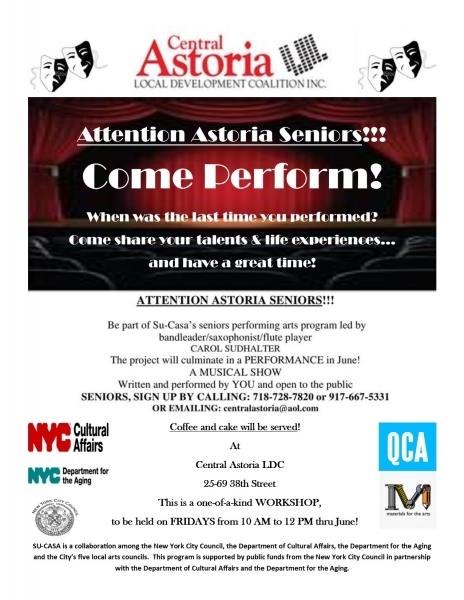 We thank NYC Council Member Costa Constantinides for making this unique program possible for Astoria seniors, as well as Materials for the Arts. SU-CASA is a collaboration among the New York City Council, the Department of Cultural Affairs, the Department for the Aging and the City's five local arts councils. This program is supported by public funds from the New York City Council in partnership with the Department of Cultural Affairs and the Department for the Aging.